Kits are used to sell a group of items together. A kit is different than an assembly in that the Kit itself is not an item, whereas the assembly is an item. In other words, when you ship a kit, you are actually shipping the individual items within the kit, whereas when you ship an assembly, you DO NOT ship the individual components but rather the assembly. An assembly (or job) can be configured which has some similar characteristics of a Kit as we will discuss later. The purpose of creating a kit is to offer the customer choices of what is included in the kit at the order time. To create a Kit, click on the Create New drop-down menu and select Item. This will lead you to the Add Item page. Select Kits Group from the Item Group drop-down. Alternatively, you can click on the Open Full List drop-down menu and select Items . Click the +New Items button from the Item List page. This will also lead you to the Add Item page. In the New Kit Item screen, you have the ability to either manually enter a name for your kit, or automatically generate one by pressing Next Item No. Select the Unit Of Measure that corresponds to the kit. If the Kit is Active, click the box to check it. You also have the option of entering a Description and Notes about the Kit. Finally, you can enter specifics about the Kit by clicking on the Custom Tab. After the Kit is created, you can select the Kit from the Item menu and then Add Components and Selections. Open the Kit record and click Edit Kit. Once the Edit Kit screen opens, click the +Add button next to the corresponding area. The Kit Component pop-up allows you to enter the Component's Name, Type, Description and select if it is 'Active'. Fixed: The component listed will always be on the kit. Only one item will be shown in the kit selection area. Variable: These components will be options that you can select from. The component that is marked as the "Is Default" will be the standard choice. The Selections pop-up allows you to enter the Item Name, Price, Quantity, and select if is being used only One Time and if the Selection is 'Active'. After completing the information requested, click Save. You can restrict the options in the Kit depending on what was selected in the previous kit option. You can accomplish this using the Kit Rules. To use the Kit Rules you will need to enable under the Item Preferences. Kit rules can only be applied to a component based on a preceding component. Rules will not apply to the first component listed. Kit rules can not be applied to or based on fixed type of components. The rules that apply to a certain component can only be based on a preceding variable type. Click on the "Rules" Button to manage the kit rules you want to apply to your kit. In the "Selections of" drop down, select the component options that your rule will be based on. In the "Depends of" drop down, select the component that your selections depend on. When users are adding a kit to an order and are presented with selection options for the Selections Of components, they will only be allowed to select items that based on the rules that are defined, are available based on the items selected in the Depends On component. 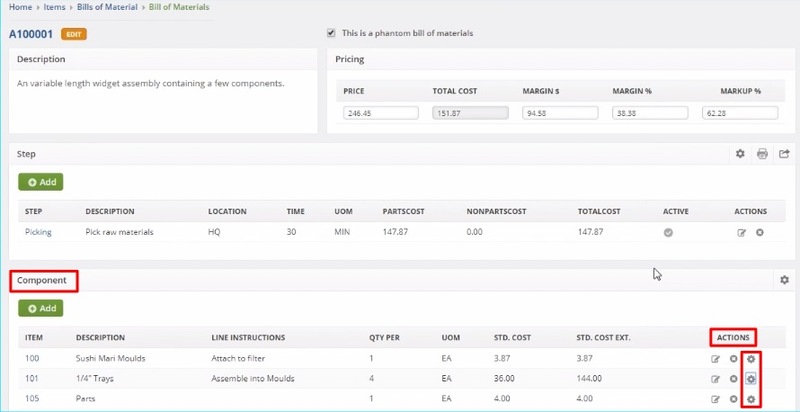 Order Time allows you to offer your customers selections and options when ordering kit items or configurable bill of materials. Once you have created them, you can establish choices and options; and you can add them to a quote or sales order later on. Click Open Full List and select Bill of Materials. Under the Actions column, click the Edit icon of the the item that you want to configure the bill of materials. Alternatively, you can click the Item and click the Edit Bill of Materials button. Click the Configure (gear) icon to where you can add a Variable or a Yes/No configuration to each of the components of the Bill of Materials. Variable: This type provides customer with choices from several items. You may list an unlimited number of alternates as long as no item is duplicated. Select Variable from the Type drop-down list. The entry is Active by default. Enter values for the Per Price, Name and Description fields. In the Add/Edit Options pop-up window , the default component will be displayed. Click the +Add button. In the Add/Edit Selection pop-up window , add your selection by filling out the Item, Price Per and Qty Per fields. Check One Time, as needed. Generally, when used on a sales order, the quantity of the kit selections is multiplied by the quantity ordered for the entire kit. You may want, however, to include an item that does not vary with the kit quantity. To accomplish this, check the 'One Time' and the selection quantity will not vary in proportion with kit quantity but rather stay fixed. Repeat steps 5 to 9 to add more selections. Yes/No: This type is used to set optional items to be included in the kit. Select Yes/No from the Type drop-down list. Enter values for the Per Price, Name, Description and Qty Per fields. Check 'Is Optional' box to set the default value to 'Yes'. Type in the Price Per value. 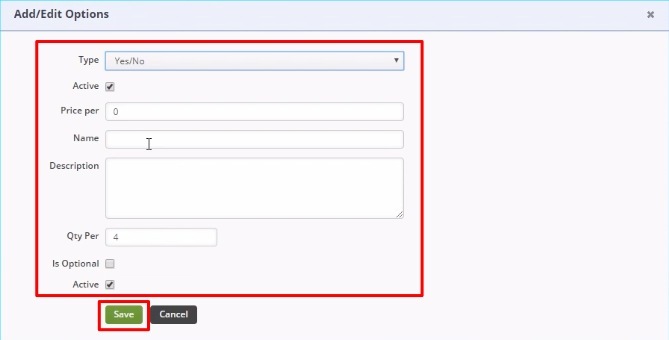 Select if you are adding the entry to a New Grouping or Existing Grouping. New Grouping: Enter values in the Name and Description fields. Existing Grouping: Select from the drop-down list. Fill out the Qty Per field.